From a clean, economical downtown motel (Best Western), to upscale motel lodging with all the amenities and rustic area charm (Bitterroot River Inn), to country B&B’s (Big Sky, The Darby), to well-appointed log homes (you can’t call them cabins) in a jewel of a setting on the upper West Fork (Alta Ranch), to secluded A-frames close to fishing (Flying R), to delightful cabins (The Cabins at Bitterroot River), and a timber framed three-bed 2 ½ bed home (The Riverhouse) on the banks of the East Fork, to public and private campgrounds ... there are plenty of options. Eateries? How about a great little restaurant with an exotic menu in an old historical building, where you can eat in your fishing clothes (Spice of Life), or the west’s best cheeseburger (Nap’s Grill), or breakfasts featuring great huevos rancheros or flapjacks the size of your plate (The Kitchen)? There is country Italian atmosphere and wonderful cuisine (Caffe Firenze) in Florence, and a Euro-California-style bakery and cafe (River Rising) in Hamilton, and more. Trails for hiking or mountain biking … wildlife viewing from the trail or the car window, don’t forget to bring the camera … neat little shops with a local, non-touristy flavor … artist’s galleries and potter’s studios ... quaint little shops and barn-like warehouses stuffed with antiques, many of them from old homesteads (the Bitterroot Valley is the site of the first white settlement in Montana) ...Lewis and Clark, Chief Joseph, history was made here. You can visit the sites ... outdoor activities from golf to hiking to rock-climbing to horseback trail rides … there’s plenty to do for every family or group member. 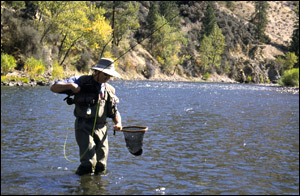 There are 80 miles of good fishing in the main stem of the Bitterroot, another 40 in the East Fork and West Fork. The river flows south to north. Its mouth is in Missoula and its East and West Fork headwaters are in the mountains to the south, toward the Idaho border. 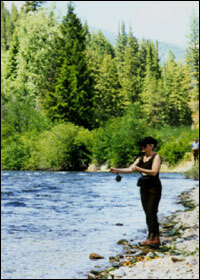 The Bitterroot is primarily a floodplain river with riffles and runs in the upper reaches that lengthen into long pools as it continues its course. It is easily waded, for the most part, and its character is varied and intimate. It is broad and shallow for most of its length, making it ideal for float fishing from rafts. Drift boats can also be used but have a rough time negotiating shallow riffles and gravel bars. The forks are primarily wade fisheries. Early season floating on the West Fork is feasible, and productive, but should be undertaken only by experienced oarsmen. Public access to the river is available at a series of old bridges that have been enhanced with public launching facilities. Wading upstream or down from these accesses can put the wading angler on much of the river’s most productive water. 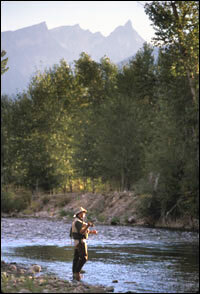 The Bitterroot is primarily a Westslope Cutthroat and Rainbow fishery, with a few Browns and occasional Bull Trout and Brook Trout thrown in. The fish run 12 to 16 inches, with plenty of 18-inch fish thrown in. A trout of over 20 inches, taken on a dry fly, is a distinct possibility throughout most of the season. The Bitterroot offers habitat to a wide range of aquatic insects. Some, which are marginal in other areas, provide abundant hatches and significant angling opportunity. Experienced anglers will find conditions that challenge and delight – and reward their efforts. In addition to the aquatic insect hatches, there are abundant grasshoppers throughout the summer. Day-long fishing with large dries makes it easy for beginning and casual anglers to score on top. Mid-March through April: Our mild spring climate produces a unique Big Olive Stone Fly hatch, and exceptional pre-runoff dry fly fishing. Big trout, aggressive and careless after a long winter, chase size 8 dries on low, clear water. Two smaller stones, #12 Gray Drakes, #16 Blue-winged Olives and a batch of caddisflies also present. Weather can be fickle, water conditions can vary. Still, this “super hatch” is more reliable than most. We take more fish 20” and over during this hatch than at any other time. Mid or late June through late July: “Glory days” on the Bitterroot, before it settles into the steady, productive dry fly fishing of midsummer. Salmon Flies, Golden Stones, Green Drakes, Brown Drakes, and all the usual Pale Morning Duns and caddisfly species on the water at once. Fishing that will reward the beginner and delight the experienced angler. Mid-August through September, well into October most years: A second hatch of #10 Brown Drakes, plenty of hoppers, the Giant Orange Sedge, along with the smaller Mahogany Duns, Blue Winged Olives, Tricos, and late season stones and caddis. Leaves turning gold on the streamside aspens, trout that are resplendent in their seasonal colors, days that are pleasantly crisp, fresh local apples tucked into the pockets of my fishing vest … this is my favorite time to be on the river. 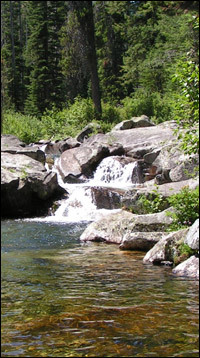 In addition to the Bitterroot, there are many waters in the area that are worth exploring on your own. These are some of our favorites. The Blackfoot is enjoying resurgence, given the increased interest and special regs that “the movie” generated. It always had a good Salmon Fly hatch in June. Now it has some fish to eat the bugs. The Clark Fork above Missoula has good Salmon Fly fishing in June, and below Missoula, from midsummer on, keeps getting better as the “evening hatch” fishing progresses. The Big Hole is just one ridge away (albeit the Continental Divide) and we fish it regularly. It does well during Salmon Fly time, too. But don’t expect to be alone there. Rock Creek is just over the top of Skalkaho Pass (accessible by SUV, old pickup truck, or rental car) or around the corner from Missoula by way of Clinton, and sees heavy use early season when the big stoneflies are out. I like it best after the Missoula crowds are gone, later in the year. Caddisflies and gorgeous scenery provide the backdrop for some potentially wonderful stream fishing. Georgetown Lake is about two-and-a-half hours away, over the same road. It is a shallow, fertile impoundment that looks natural, and yields trout that range from two to five pounds on damsel, callebaetis, and caddis hatches. Our annual trip to Georgetown is one that my wife Jan refuses to miss. If you’re into stillwater fishing and relaxing in a beautiful setting, visit Georgetown. And then there are my favorites: the small streams that feed the Bitterroot. Each is different in size and character; each has its own charm. Explore them in wonderment. Catch dozens of brilliantly colored native trout (not all of them small), hone your angling skills, escape from the world and be nine years old again. Plan to bring a light rod and set at least one day aside to explore these jewels that tumble from the crown of the Selway-Bitterroot Wilderness Area.